The last of my books are going into their boxes, my music collection hawked for nearly nothing, and I toasted my friends last night for a going away dinner. The suitcase that I will be living out of for the next nine months is packed. My plans this summer have changed a dozen times, through events both in my control and totally out of control. Some archaeologists have settled down, have nice homes and steady jobs, but there is a complimentary population that, to take another Tom Waits cue, raindog–travel around after jobs and live on the road. It wears you out, eventually. Most don’t do it permanently, and certainly I’ll be applying for academic jobs. But today, I’m putting all my things in storage and hitting the road. College Students | Waco, TX | 3-Person Household | Drummer for death metal band. Mark Menjivar spent three years photographing the insides of refrigerators. He posts the results, along with a few details about the owners of the refrigerator, such as their profession, where they live, how big the household is, and then a strange yet salient detail about their lives or about their eating habits. It is an almost perfect example of what we call Hawkes’ ladder of inference in archaeology. Delicatessen Attendant | Daphne, AL | 4-Person Household | Disowned by parents for marrying a black man. In 1954 Hawkes wrote a very influential article regarding interpretation in archaeology, stating that while certain basic information can be gleaned from the material record, without a historical/documentary context it is difficult to ascertain ideological aspects of the people who made the objects. Using the example of the refrigerators, from their time-capsule-like contents, we could probably determine where the person lived, approximate how many people lived in the household, perhaps even glean a profession (getting higher on the ladder of inference), but the last, ephemeral bit can be frustratingly out of reach. Regardless of whether or not you find much truck in Hawkes’ slightly dusty ladder, there will always be something unknowable about people, whether they are dead and buried or your next-door neighbor. Something that, even if they left their entire home intact, you would still miss it, something vital, something that is more true to them in describing themselves than anything else in the world. I find this incredibly poetic and disastrously frustrating. Anyway, I think I might use this as an assignment as a garbology alternative, assuming I ever get a teaching job. 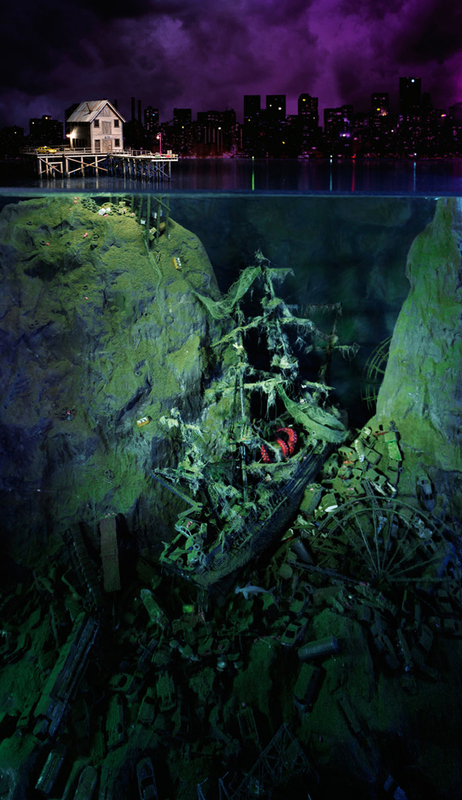 I was nudged back into the world of blogging today by the fantastic art of Lori Nix, a photographer who makes incredible tabletop dioramas and then shoots them with a large format camera. The results are stunning. A closer look at Lori Nix’s website reveals a play on the photographic trope of ruin, something very much prevalent in the photography of archaeologists. She creates an abandoned landscape with a focus on civic structures, structures where we record and celebrate the triumph of civilization. I particularly like her take on the Natural History museum — she’s created dioramas within a diorama, showing our desire to recreate nature within structures, then the ultimate intrusion of nature. I find her work playful, rather than the cliched wallowing in ruin that photographers (including myself) usually pursue. I’ve been thinking about dioramas for a few years now, especially after the virtual reconstructions of Catalhoyuk I worked on in Second Life. Digitally modeling individual objects was truly tedious, but still gratifying when the entire model came together. When I mention dioramas to archaeologists, they get remarkably excited–are we are all secret dollhouse keepers, manipulating people in the past to pose perfectly with that cob of corn, lighting a fire, catching a fish? The dioramas at Mesa Verde are stunning examples of interpretive archaeological dioramas that delight the half a million visitors the park receives every year. These dioramas are evocative in the way that the preserved archaeological excavations are not, and I would argue that they attract more interest than the same scene rendered in 2D media. In a wonderfully reflexive and uncharacteristic move, the park has an extensive display regarding the making of the dioramas by our friends, the previously mentioned CCC. While I’m certain that current scholars of the ancestral Puebloans would find faults with the specifics of the interpretations that inspired these dioramas, Meredith Guillet, Paul Franke and Kenneth Ross reproduced actual artifacts in miniature, and went so far as to fire pots in order to break them, creating a more realistic scatter of sherds. 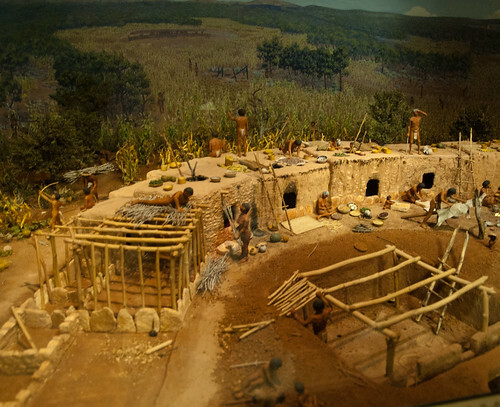 The dioramas took about five years to complete, or “1,100 man-days” according to Ronald Brown and Duane Smith’s New Deal Days: The CCC at Mesa Verde. Would that we could have a similar investment in our museums and national parks by our current administration. When I finally wandered away from the museum (the rest was full of really fun CCC/WPA displays) I saw a sign that seemed to indicate that there was a new museum in the works. Not so, but for a moment I was really worried–would these classic displays be scrapped in favor of touchscreens and boring videos with flute music? Though my reconstructive talents (such as they are) are squarely within the digital realm, the power of dioramas remains unparalleled. Perhaps they are too powerful, too compelling as a monolithic interpretation. But do we sacrifice the intense, imaginative experience and fascination to a multivocal touchscreen? Can we ever make a digital experience as truly immersive as looking at wax figures fighting with a dog, frozen in time for 80 years? A little over a year ago, I spent a night in Hama. That day, Dan, Melissa and I were checking out sites in western Syria for potential projects and had gotten ridiculously lost in the mountains. The mountain towns were lovely, friendly and felt refreshingly relaxed. But it was late, and we were all tired, starving, and indecisive – a potentially lethal travel combination. We crashed in our hostel and then went out to get felafel. It ended up being the best felafel I’ve had in my life. Then we wandered the streets. It was the beginning of June and dead hot during the day, so most folks came out at night to socialize. At first it seemed like it was a shibab-dominated scene–boys were everywhere. But there were women around as well, enjoying the night air. We walked by the famous waterwheels – great, groaning, wooden dinosaurs that are monumental in scale and lit up like a carnival. The splashing water cooled the sweltering night, a miracle of relief in the desert breeze. I hadn’t expected much out of Hama; it was a way-point in a misshapen quadrangle between Damascus, the coast, and Aleppo. But more than the groaning waterwheels, or the dark, cobblestone maze of the old city — the people of the city. The women. Or, one woman. There were a group of ladies on the street just wearing hijabs without a full veil, only slightly older than me, chatting and eating ice cream. I smiled at them, well, because I don’t generally see a lot of women while travelling in the Middle East and I miss their company, if only on the street. It’s a strange and lonely feeling when you recognize it. The women hesitated, smiled back, and then one lady grabbed my arm. I wasn’t actually all that surprised by it, as I’ve become accustomed to displays of sisterly affection and warmth from a wide swath of amazing Middle Eastern women, but what came next did surprise me–she wanted me to have a bite of her ice cream. I didn’t really get it at first, but even after several demurrals, she insisted. We shared a melting bite of ice cream, laughed, hugged, and went on our way into the night. So tonight, as the protests in Hama rage on, I’m thinking of her. Solidarity with people who are yearning, aching, struggling to be free. Always.